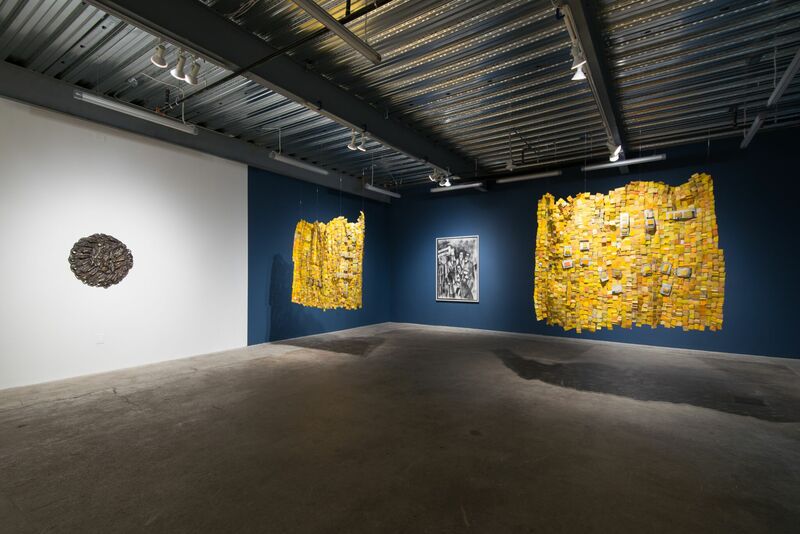 Installation view, Everyday Myth: Survival and Sustenance, Serge Attukwei Clottey at Ever Gold [Projects], San Francisco, 2018. 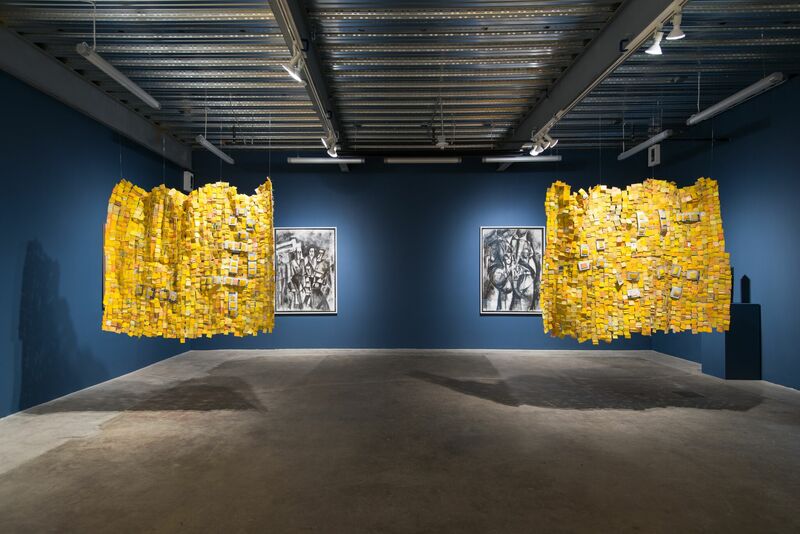 Ever Gold [Projects] is pleased to present Everyday Myth: Survival and Sustenance, an exhibition of new sculptures and works on paper by Serge Attukwei Clottey. 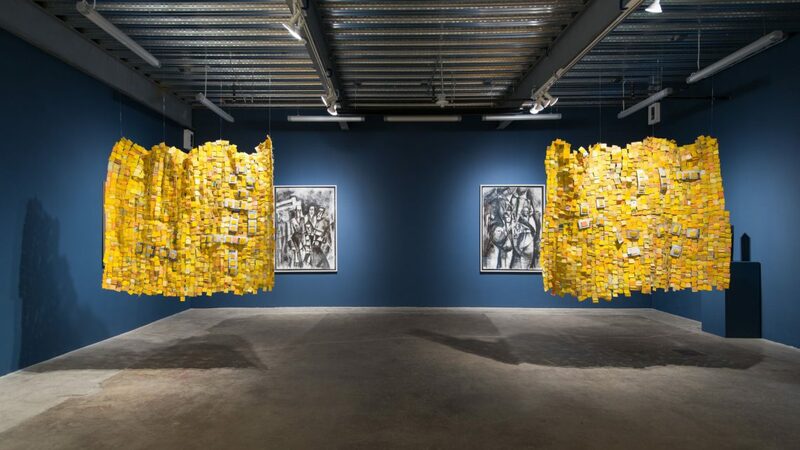 Serge Attukwei Clottey lives and works in Accra, Ghana’s capital city. His work is concerned and engaged with the condition of the local environment—socially, environmentally, and politically. Clottey’s studio provides work for a group of collaborators known as GoLokal—initially a small group, now with approximately 100 people involved. In addition to Clottey’s own studio practice, he and GoLokal produce public artworks and performances, with the performances often functioning as political/environmentalist gestures and statements. A signature material for Clottey is plastic cut from bright yellow water containers known as Kufuor gallons. In the early 2000s, these containers were filled with water and distributed by an order from then-president John Kufour in response to massive drought throughout Ghana. Today the gallons are a prominent form of litter, and Clottey—among others—believes they were not particularly safe vessels for drinking water to begin with. 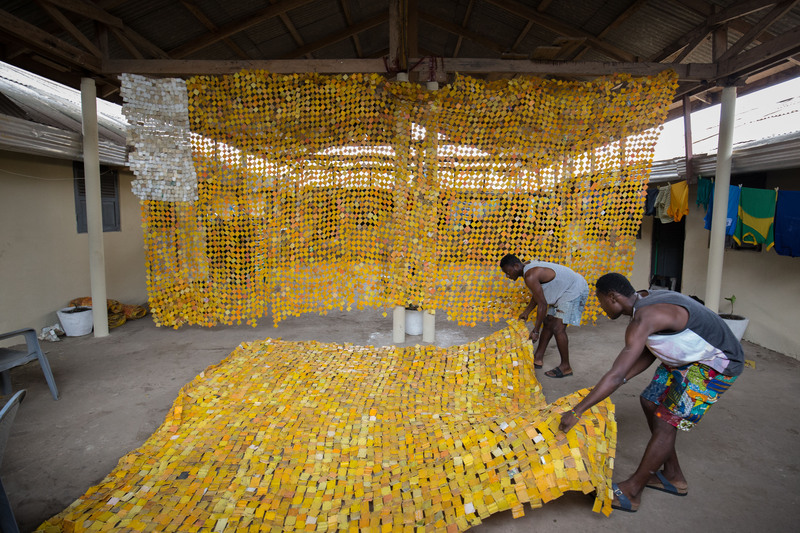 Clottey buys the containers back from members of the local community, cutting them into rough squares and wiring them together into wall hanging sculptures. The sculptures often include components pulled from the sea—The Displaced, a 2015 film documenting a performance by Clottey, demonstrates the surreal and disturbing amount of discarded plastics, electronics, and other forms of debris in Ghana’s coastal waters—and painted additions as well. Clottey cuts the top of the containers off to produce a kind of mask-like form that he uses sculpturally in place of traditional (and famously appropriated) African masks, referring to the form as “a mask for our time.” A new series of bronze sculptures replicates these plastic forms in bronze. 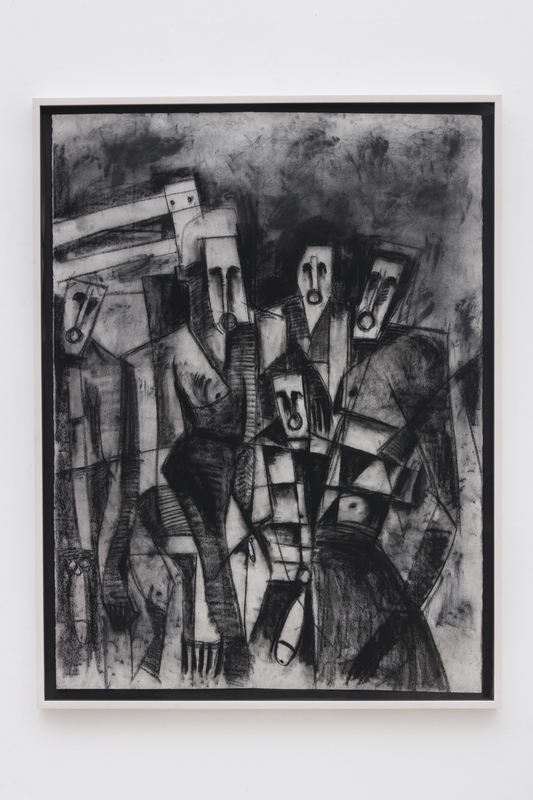 A new series of charcoal drawings plays on the history of cultural exchange between Africa and the West, as does much of Clottey’s work. 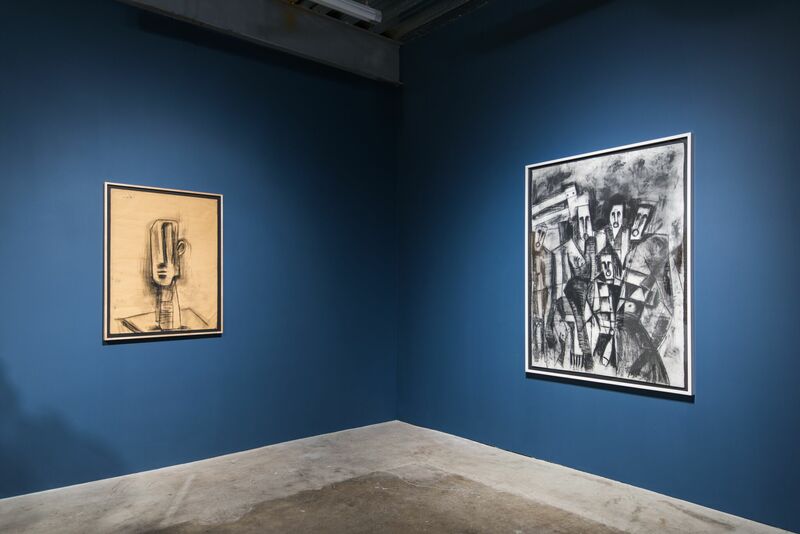 Captivated by the work of Picasso while enrolled in art school, Clottey presents drawings that seem to pull from the format and treatment of works from Picasso’s African Period, inserting the top part of the plastic containers in place of Picasso’s mask-like faces. The three different bodies of work presented in Everyday Myth: Survival and Sustenance raise a range of questions about the influence of the West on Africa and Africa on the West, as well as about the reality of these relationships. In political, environmental, and art historical contexts, it is arguable that these relationships are romanticized, polarized, and otherwise strategically manipulated in ways that complicate our understanding of these relationships and the realities of the people who feel the results of these myths most concretely. 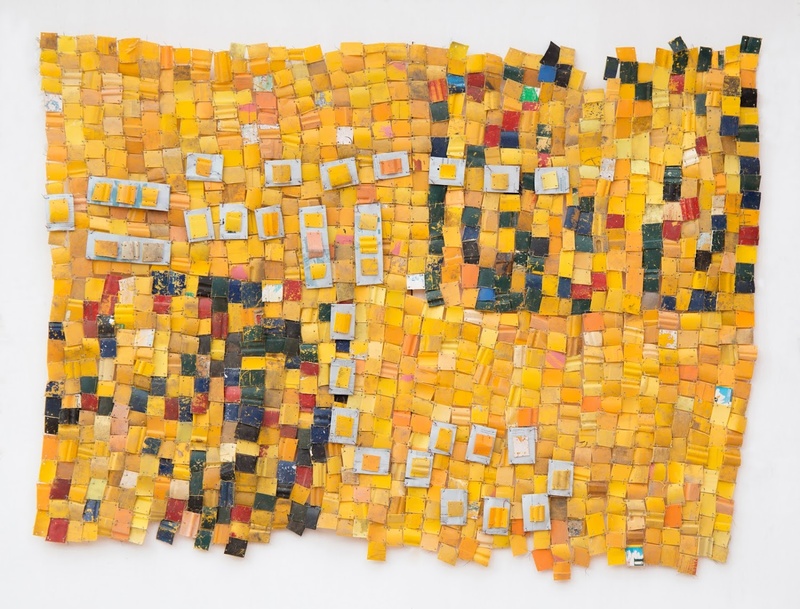 Serge Attukwei Clottey lives and works in Accra, Ghana. Clottey attended the Ghanatta College of Art and Design in Ghana before studying at the Escola Guinard University of Art in Brazil and has completed multiple fellowships abroad. He currently works in a variety of media including performance, photography, video, painting, drawing, and sculpture. 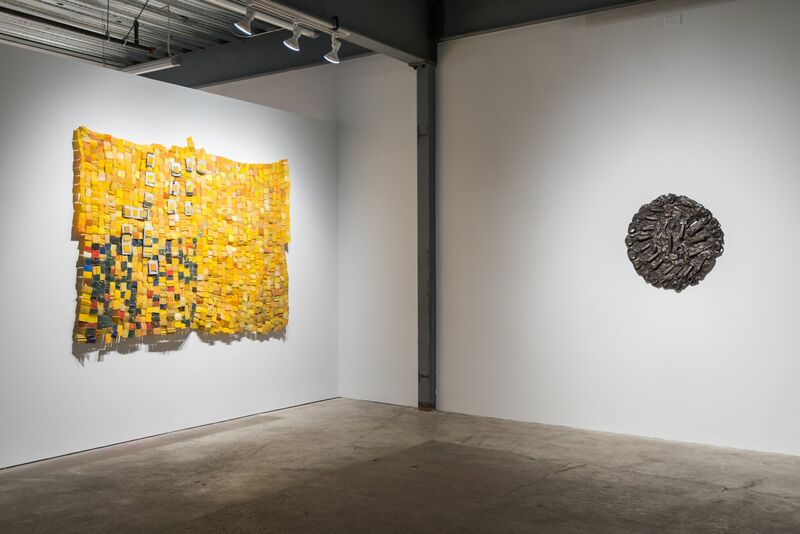 Recent exhibitions include Differences between at Jane Lombard Gallery (New York, 2018) The Displaced at Gallery 1957 at Lawrie Shabibi Gallery (Dubai, 2018); Hand to Mouth at Ever Gold [Projects] (San Francisco, 2016); My Mother’s Wardrobe at Gallery 1957 (Ghana, 2016); Earthly Conversations at GNYP Gallery (Berlin, 2016); The Displaced at Feuer/Mesler (New York, 2015), We Don’t Contemporary at Kampnagel Hamburg (Hamburg, 2015); The Silence of Ordinary Things at The Mistake Room (Los Angeles, 2015); Du Bois In Our Time II at the University Museum of Contemporary Art (Amherst, MA, 2014); and Cultures in Confluence at the Goethe-Institut Ghana (Accra, 2011). 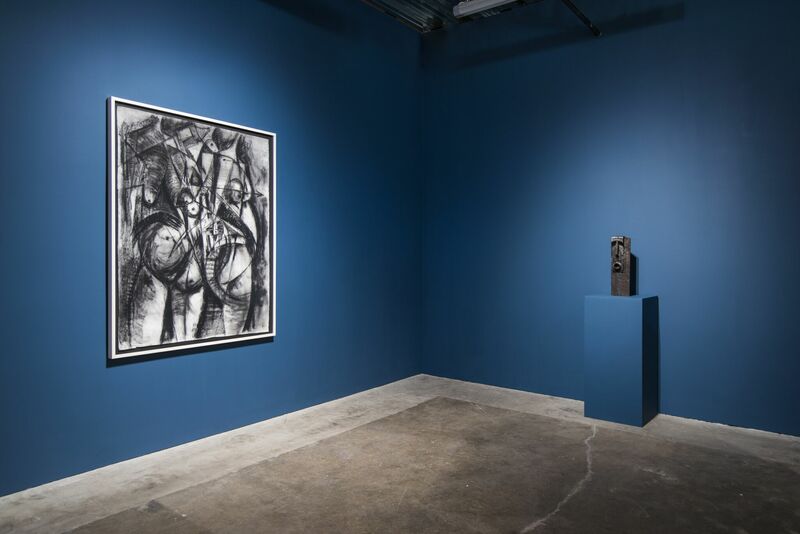 His work is in the collection of the Nerman Museum of Contemporary Art (Overland Park, Kansas) as well as a number of international private collections. The Keepers (Ed 3 of 3), 2017. 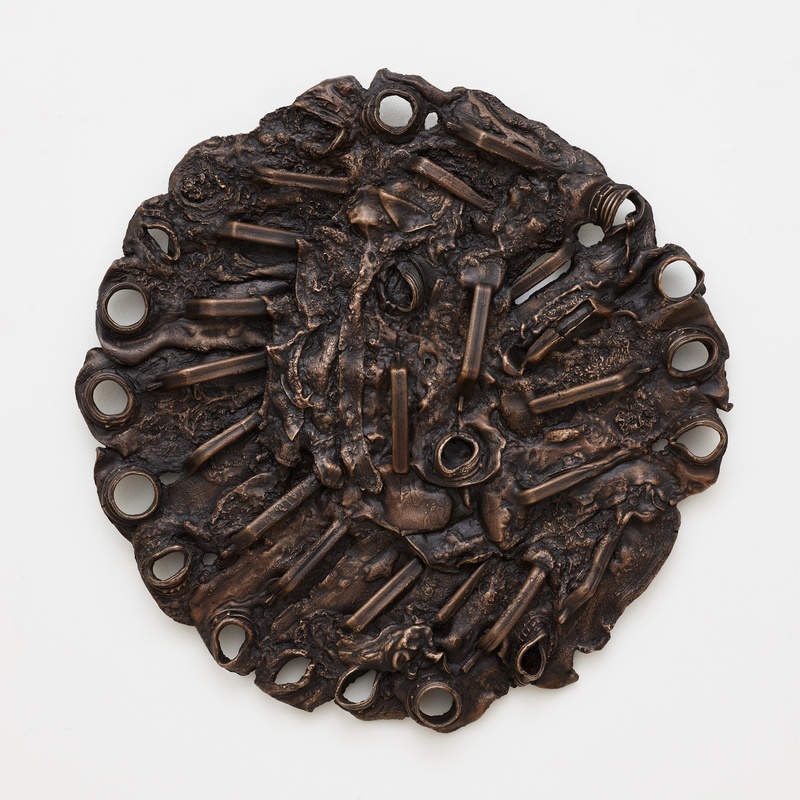 Bronze, 30 x 30 inches. Make it possible, 2017. Plastics, aluminum plates, wires, and oil paint, 60 x 81 inches (152.4 x 205.74 cm). Protocol, 2017. Charcoal on paper, 60 x 45 inches.